Lyric Woodworking delivers design solutions that create harmony and call forth the character and soul of trees. Shaped in the evergreen influences of imagination and innovation, the furniture and installations of Joshua Bowles elevate and energize – transforming the spaces of our lives. Inspired by nature and fine art, Joshua Bowles is a Hawaii furniture designer who wields wood in a manner that’s exquisite, reverent, stylistic and surprising. His work encompasses a diverse portfolio from tables, desks and consoles, to bedroom and outdoor furniture, media centers and architectural details. 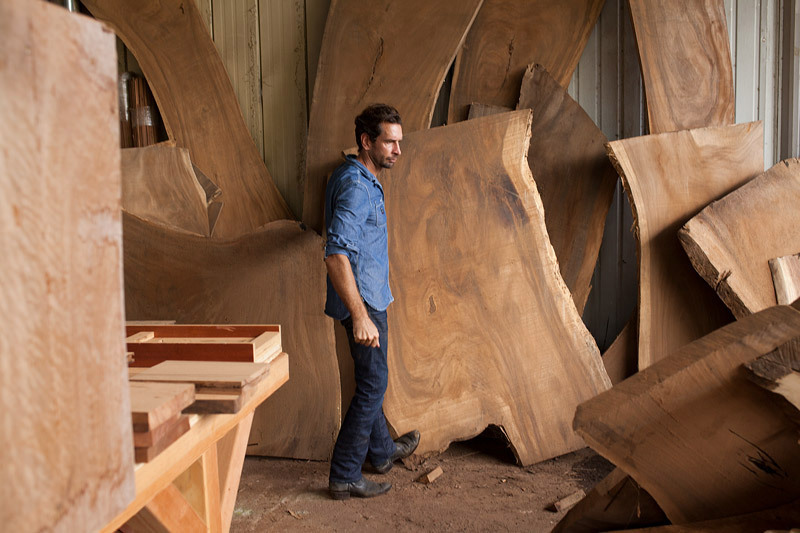 In order to shape every step of the process, he sources his own native wood, owns a saw mill and innovates furniture as one-of-a-kind creations. Each masterpiece is a creative expression of form and function and is brought to life in his studio on the North Shore of Oahu. He hails from generations of wood workers, builders and master carpenters who centered their lives around nature and trees. His father is a luthier – turning wood for the love of music. He studied design and architecture at University of Texas and honed his craft with an architect, a black smith and design professor. His influences include the legendary George Nakashima and he specializes in the art of Japanese joinery. He works with businesses and individuals who believe that furniture is an expression of their values, imagination and spirit. Furniture and installations are built to beckon prosperity and embody your project’s identity in a holistic way. Lyric Woodworking specializes in collaborating with architects and designers to achieve a client's vision of beautiful and functional spaces. From furniture to wall and ceiling treatments, he mills and installs statement pieces for hotels, restaurants and mixed-use common spaces. As the owner of a design and build company, Joshua has worked with a myriad of corporate and individual clients. The journey begins with listening to your aspirations, exploring a synergy of ideas and no-cost, no-commitment consultation in which you will be guided through each step. Lyric Woodworking specializes in discerning desires, sharing examples and narrowing down the specifics. An initial proposal can be developed that meets your needs, captures your vision and is refined to your satisfaction. The proposal includes a timeline and budget that offers the most for your investment. Once your order is placed, the magic begins. The experiential collaboration and partnership enables you to personally select your wood and engage in the process. Lyric Woodworking uses only solid wood acquired ethically and sustainably. We deliver to anywhere. Email us for all the details. transcend the terrain of time. Lyric Woodworking has been featured in The Honolulu Star-Advertiser, MidWeek and Honolulu magazine. Find us on Facebook or follow us on Instagram to witness creations in progress. Lumber and slabs are also sold by appointment. Call for a tour of our sun-soaked. open-air workshop and design center on the North Shore of Oahu.